Italian wedding musicians. Musicians for weddings in all Italy. Music of every kind, for all the aspects of the event. Only qualified professionals. Italianweddingmusicians can supply you with the best professional Italian musicians for what concerns live music and music entertainment for weddings, ceremonies, blessings, receptions, wedding parties, private parties, dancing parties. The choice of music for a wedding means the right choice for a good outcome of the event, from the ceremony to the aperitifs, from lunch or dinner of the wedding to the party and the dances after dinner. The musicians of italianweddingmusicians can offer a high quality level of performance guaranteeing a 100% success to your wedding party. We speak English and we have 20 years of experience in the music field for international weddings. We have worked successfully in thousands of a parties all over Italy where live music was required. Our musicians have a good experience in foreign weddings in Italy like English weddings, Irish weddings, American weddings, Australian weddings, Dutch weddings, German or Austrian weddings, Swedish weddings, Russian weddings and so on. Musicians for wedding ceremonies and aperitifs. Classical musicians for receptions. They can play classical music from 1900s renaissance to Baroque, neoclassicism, romanticism – but who also know how to play modern music and Jazz. These musicians play in private parties, receptions, weddings, ceremonies and aperitifs of every kind. Musicians who have played in concerts, in tournée in theatres, squares all lover Italy, who have played with orchestras and important National ensembles. Wedding string quartets, harps, violins, string ensembles, duos, trios, quartets, quintets, with singers, tenor singers, soprano singers with organs and all the possible formations. Musicians for wedding receptions and dances. The best musicians in the area and in the field for music entertainment during lunches or dinners and for after dinner dances. Wedding rock musicians, pop musicians, jazz musicians and groups of all kinds. Duos, trios, quartets, quintets. From the most requested duo of guitarists in Italy for weddings – Irish, English and American – with Italian and International music – rock, pop, funk, disco, soul, latin-American to Wedding jazz trio or a swing, rat pack band. All our musicians have important professional experience and play suitable music for your wedding – making it more exciting and fun but also more romantic and unforgettable than you can possibly imagine. The musicians at italianweddingmusicians are brilliant professional musicians who can transform your wedding into a real event which all your guests will remember with pleasure. Musicians for wedding receptions, receptions in restaurants, receptions with catering, receptions in villas, in gardens or in country houses. Music for entertainment during your dinner parties or dance music, music entertainment at parties with live music and DJs. 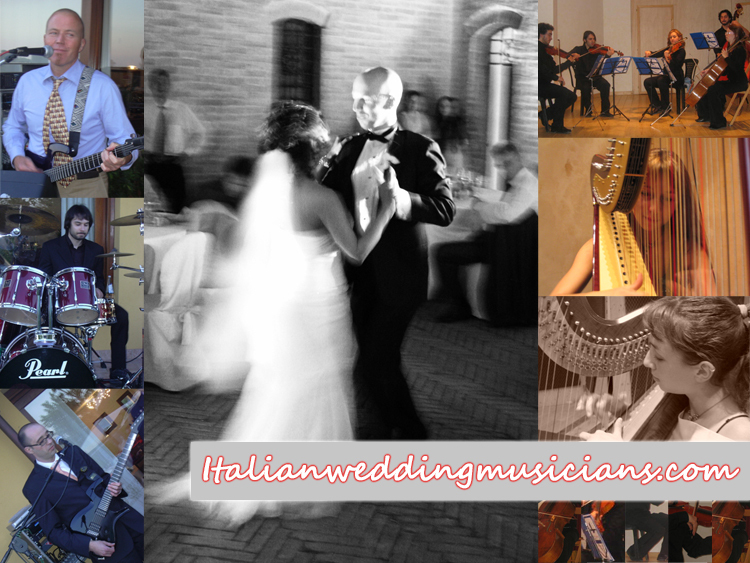 Italianweddingmusicians supplies musicians all over Italy!